Where Daniel Boulud is concerned, The Restaurant Dieter may not demur. His husband is so passionate about the chef that no new venture can be ignored for long. Not surprisingly, another recent trip to New York landed us at Boulud Sud on the Upper West Side, the French master’s foray into Mediterranean cooking. And what a trip it was: The restaurant touts foods from France’s Côte d’Azur to Spain, Italy, Greece, North Africa and Turkey. If the food isn’t to your taste, well at least there’s the geography lesson to consider. 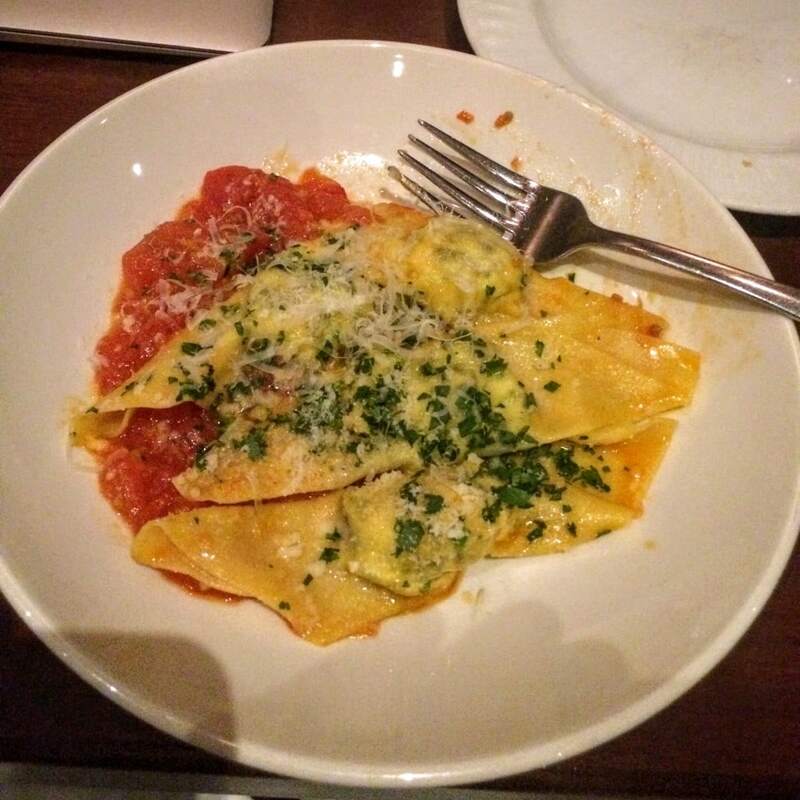 Fortunately, the food lives up to Boulud’s high standards. The menu divides the dishes based on where they come from: De La Ferme (the farm), De La Mer (the sea) and Du Jardin (the garden). There are appetizers, plates to share, mains and side dishes. 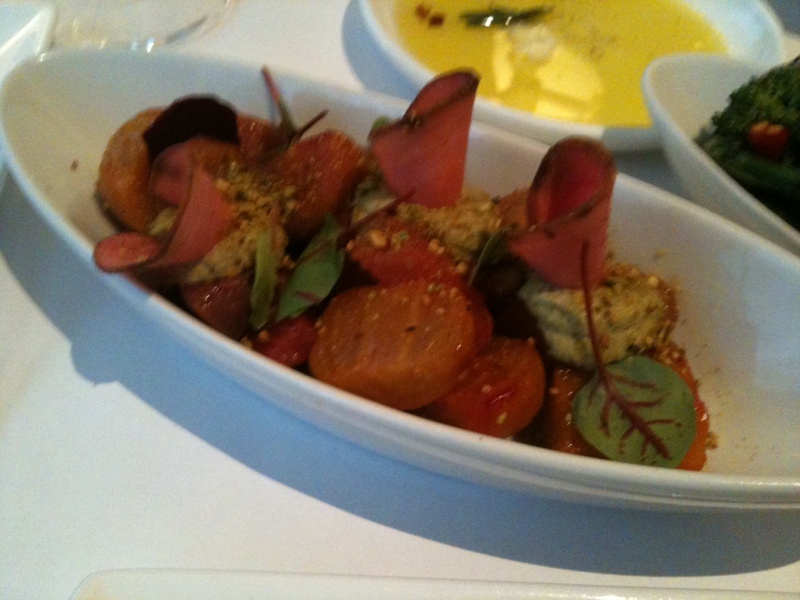 In fact, the garden menu is a bounty of vegetable dishes; a vegetarian or even a vegan could do rather well here. Seeing as this was a Boulud enterprise, the server was knowledgeable, pleasant and helpful. He pointed out several diet-friendly dishes, mostly from the fish main courses. His timing was excellent, for it allowed us to move past danger territory. Moments before, the bread basket had arrived with a garlic foccacia and buttery flat bread that reminded one of Indian paratha rather than a more typical pita-style flatbread. It was crispy, chewy, yeasty and buttery all at the same time. 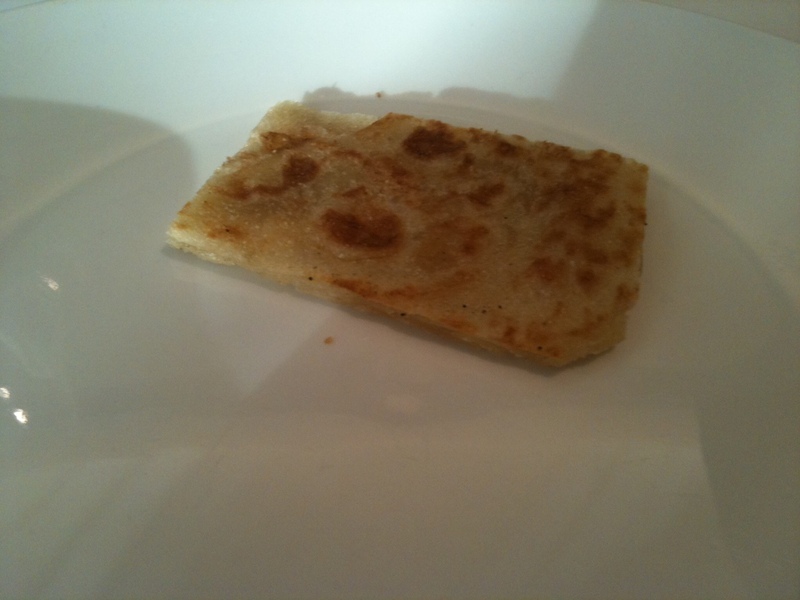 And that was plain, served with nothing. Imagine it served with Boulud Sud’s hummus or babaganoush. It could easily have been our entire dinner and a diet disaster. Instead, a serviceable classic Greek salad arrived for me (dressing and feta on the side, of course) and delicately fried artichoke hearts, Roman style, for my spouse. I tasted a piece of one with a dab of aioli — just enough to know that I was better off with the salad. It consisted of tender and small whole romaine leaves from the middle of the heat, fat heirloom tomato chunks, kalamata olives, shaved red onion, seeded cucumber and peproncini. As a main, I ordered an appetizer portion of grilled blue shrimp and two of the vegetable side dishes, which are large enough to share. The shrimp came head on and with the smoky bouquet of the grill. 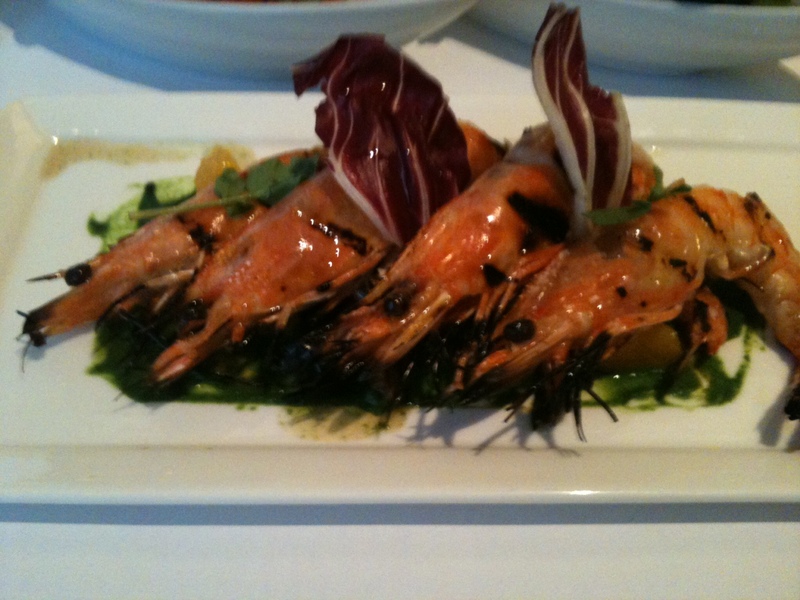 They rested on a subtle watercress puree and pungent grilled chicory. The real highlights were the vegetables. 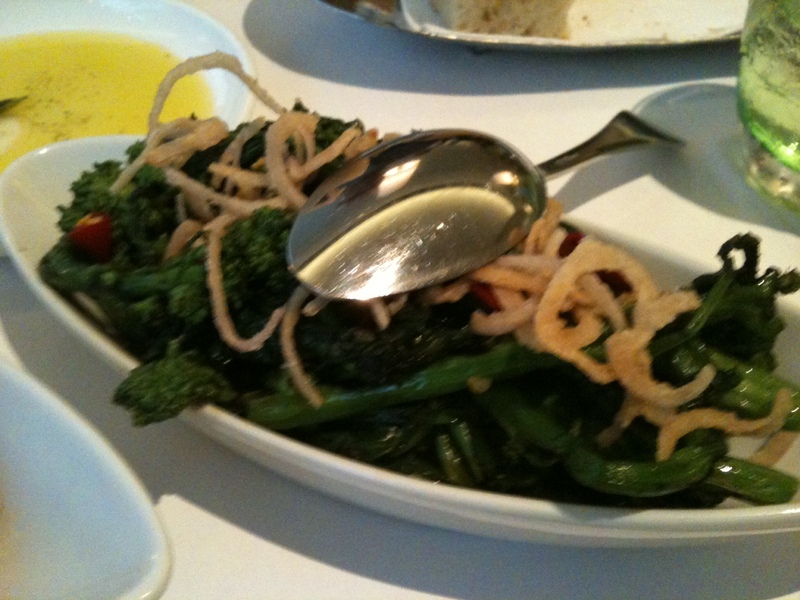 Broccoli rabe with a pleasantly bitter edge was charred and tossed with pepperoncini, topped crispy shallots. Tucked among tiny roasted beets were dollops of a lucious, thick Greek-style yogurt infused with a dust of finely chopped pistachio. Sometimes, you have to just admit your spouse is right. So The Restaurant Dieter and his spouse found themselves stopping in one Friday night after landing at LaGuardia. My spouse got to the airport from work before I did, so I missed the obligatory coin flip that determines who gets the upgrade to first class. So while The Restaurant Dieter made do with peanuts and a Fresca, his spouse in 3C dined on a chicken sandwich with wine and pretended not to notice actor Hal Holbrook in the next seat. Hal had the beef. With 8 hours having passed since lunch, it was time for something fast, fresh and without a lot of fuss. Nanoosh’s menu seems to fit the bill perfectly. With all of its emphasis on EVOO and organic — “we have a deep and abiding belief in the power of food to help us live a healthier and more fulfilling life” — it even seems virtuous on a diet. Certainly, it can be. 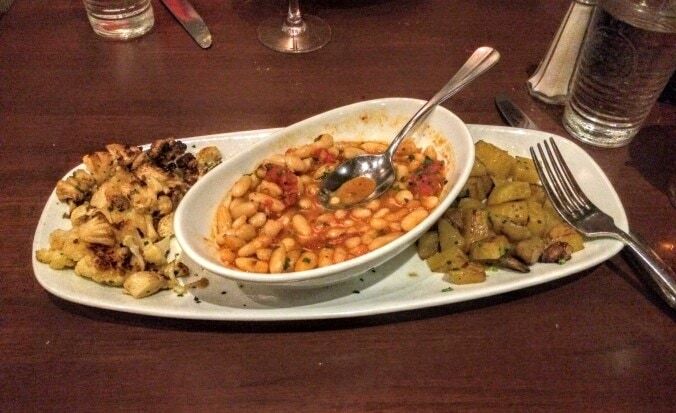 However, it would be a mistake to suggest that all Mediterranean food qualifies as diet-friendly. That pool of oil floating atop your hummus is only the start. Ask to leave the oil off, you’re still looking at a sesame-paste-and-chickpea dip that’s probably more than 100 calories and 5 grams of fat per 1/4 cup. 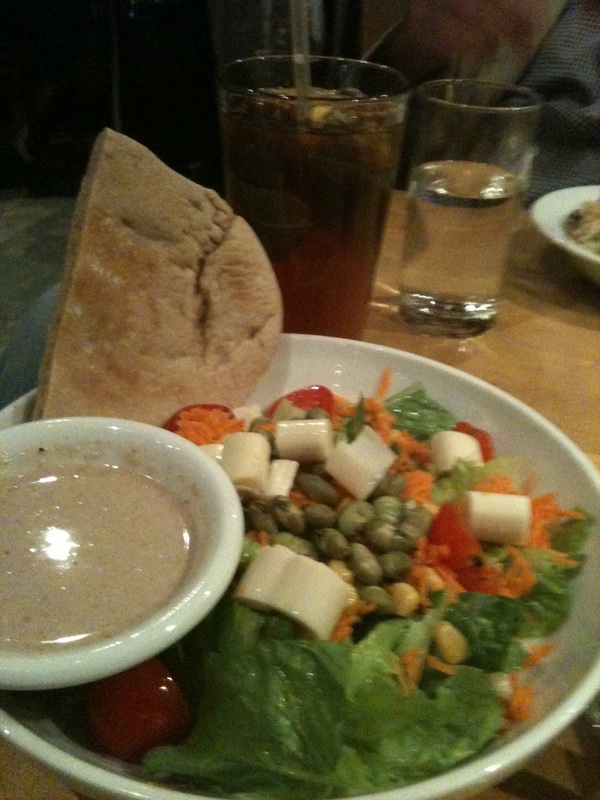 And let’s face it, with good whole wheat pita like that served at Nanoosh, nobody’s limiting themselves to a quarter cup. Still there are abundant salads on the menu, along with grilled chicken and tuna. Given the coolness of the evening, it seemed time to dip into a bowl of soup. Nanoosh offers two: organic tomato and a lentil with — of course — organic lentils, organic carrots and organic onions. Somebody on that staff decided that a single adjective wouldn’t do, but that’s another story. 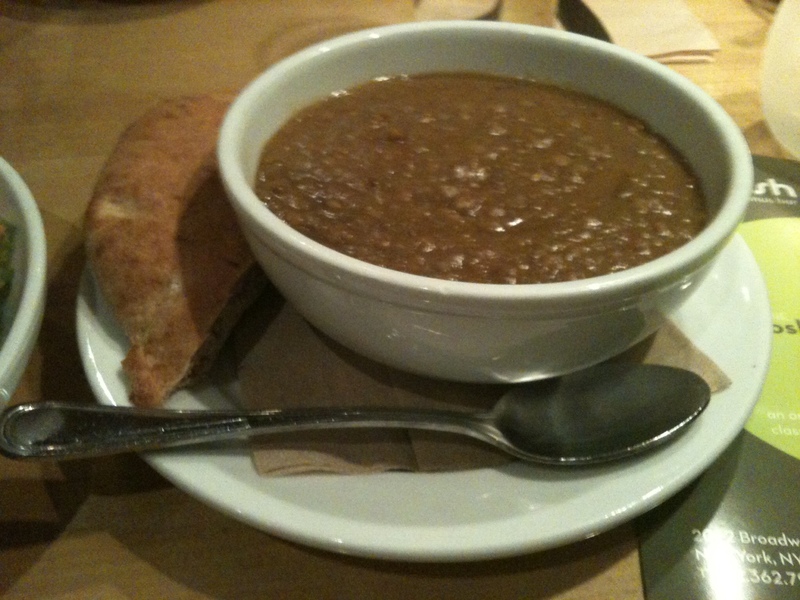 The soup was a thick porridge of puree and soft whole lentils with enough spice to keep its ultimate brownness from tasting, well, brown. The bowl was large and might well have been dinner in and of itself. Even though it was only $5.50, an option for a smaller cup might be nice. With it I had the garden salad. And I do mean with it; for some reason, they arrived at the same time, crowding the typically small New York restaurant two-top. 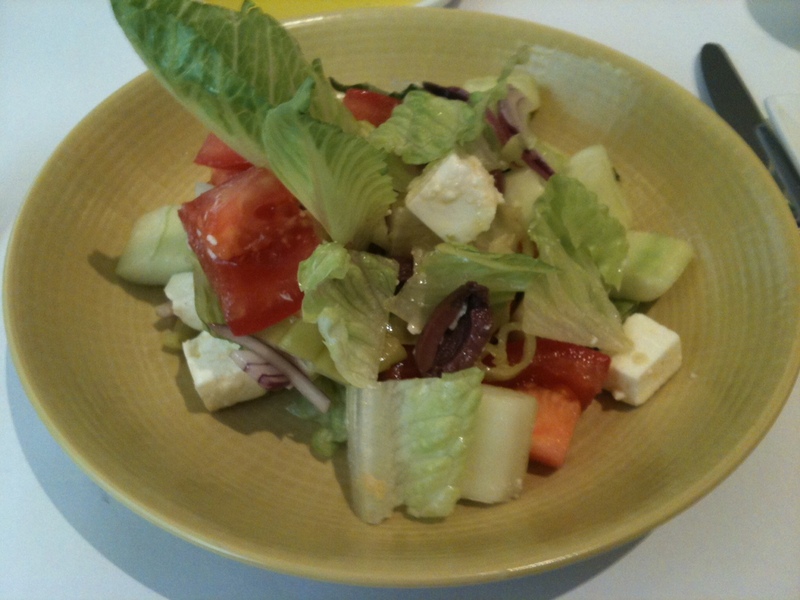 The salad was a litany of “organic” adjectives as well — romaine, cherry tomatoes, carrots, corn, heart of palm. For a little zing (and protein), the kitchen tosses on a handful of dry roasted edamame. The dressing choices were an extra virgin olive oil and citrus and something really different: oil-free walnut and grapefruit dressing. Non-fat dressings tend to be awful, don’t they? Somehow all that crunchy vegetable-ness usually demands a little silken oil to feel satisfying. But a dressing that unusual had to be experienced, so I went with it. The server said it was a concotion of ground walnuts, walnut extract, grapefruit, sugar, salt and pepper. The flavor was light and fresh, but thanks to the ground nuts, a little gritty. Given the fats present in nuts, it may have been oil-free, but it was not fat free. However much fat the walnuts contributed, it still seemed to need a dash of olive oil. Even then, it did not break the bad-no-oil-dressing rule. Next time, I’ll try the olive oil and citrus dressing. Nanoosh is the kind of place where you stop in. Again and again.